Plot Summary: A mysterious flu takes over the town, while Joel tries to have a romantic weekend with his fiancé Elaine, who is visiting from New York. Listen to the podcast of this episode here. In the opening scenes of “Russian Flu,” we slowly learn that a bad flu is afflicting the residents of Cicely. Shortly after treating the sick pilot who was slated to fly Elaine into town, Joel learns that Holling won’t be able to take him and his fiancé out to the lookout as promised because he’s sick, even though we learn that Holling never gets sick. From this tidbit, we get a sense that this might be a particularly nasty virus. Maurice chalks up sickness to a kind of moral flaw, exclaiming, “You never get sick if you live right and keep negative vibes to yourself.” However, we learn later that Maurice does get sick, as does Ruth-Anne, Chris and the rest of the town (the exceptions are Maggie, Marilyn, Ed, and Joel – for now, at least). If we look at the flu as the framing device in the story, we see that the whole episode is one long fever dream. In the podcast, we remarked upon the dreamlike qualities of the episode, like the dream sequence, the Twin Peaks scene, the music which directly contains mentions of dreams in them (“New York, New York, big city of dreams” raps Grandmaster Flash), and how Maggie’s final words to Joel in this episode are “In your dreams, Fleischman.” The episode begins with a shot of Joel waking up, and throughout we see Joel and Elaine in bed, lying down on the couch, and even the final scene has Joel reclined on his couch. Dreams are, by their nature, nonsensical, but a fever dream is even more so, and further tinged with a sense of danger and threat. It is, after all, the body’s way of fighting an infection. As the infection spreads, the episode becomes more and more unreal, culminating with the New York dream sequence which finds Joel living his dream life in Manhattan and encountering Chris, Maurice, and other residents of Cicely in the middle of Park Avenue. Inexplicably, Holling is a doorman, and Shelly is a call girl (perhaps revealing what Joel really feels about their relationship? ), and his fiancé becomes his sister; more disturbingly for Joel, Maggie is his wife. It is significant that this dream occurs while Joel in the process of getting sick – when he wakes up the next morning, Joel is already coughing, and his illness will deepen as the day progresses until he is suffering with the full-blown flu in the final scenes of the episode. 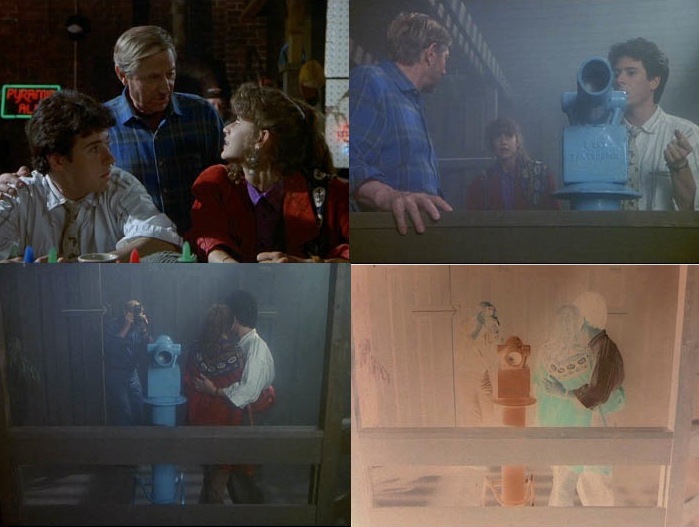 But perhaps the strongest argument for thinking about the episode as a fever dream is the addition of the scene where Holling takes Joel and Elaine to view a beautiful panorama. This moment clearly echoes the show Twin Peaks, and includes the shot of the falls, the lookout, mentions of coffee, cherry pie, donuts, and a lady with a log. This scene comes out of nowhere. One moment, we are at the Brick; then, as haunting music swells, we are suddenly transported to a waterfall. The whole feeling is surreal and dreamlike, but there are no indications that it is another dream sequence; in fact, the whole scene is treated like a normal one, and we cut back to Joel saying his goodbyes to Elaine, as if the previous scene had not even happened. What to make of this strange Twin Peaks-inspired insertion in the episode? We would argue that it’s the manifestation of the sickness of the town, and is like a hallucinatory fever dream. We experience the illness through the experience of the town as well as from the perspective of Joel, as if the fever overcomes the traditional boundaries of the episode. The Good – The dream sequence set in New York is astonishing and ranks as one of Northern Exposure’s best, which is saying something because the series will feature many dream sequences in later episodes. The Bad – One of us thinks the Twin Peaks-esque scene is a misstep, and the other one thinks this episode is too Joel-centric. The Notable – Marilyn’s enigmatic, knowing smile in response to Joel’s repeated requests to learn what is in the Hio Hio Ipsunio that smells like moose dung. It’s no coincidence that in Joel’s dream this smelly local remedy appears as chicken soup, which is mentioned throughout the episode and may well be (at least in Joel’s mind) its western equivalent. (We freely admit that chicken soup is one of our favourite things to eat.) Marilyn’s teasing smile at hearing Joel called ‘Joey’ is also pretty notable. Hi Ana, great point about Marilyn and Joel. It’s very true that he’s losing the one real connection to his old life in New York (Elaine). He is definitely getting to know that there is more to the town of Cicely than he initially thought. And Marilyn will always be a mystery to him :-). Thanks for visiting our site. It’s great to connect with all Northern Exposure fans! I watched Twin Peaks and Roseanne on TV in 1990. That’s about it. I totally remember commercials for this show but never ‘got it’ nor had time to wedge in more TV . I’m glad I didn’t as now i have something to do in my old age and watch TV shows. Anyways, to call the dream sequences “Twin Peaks” makes no sense as it is a dream state, not an alternate dimension ! I have heard many times this was a rip off of Twin Peaks and I know you’re not saying this exactly.. so a show shot on a Pacific NW location with Mountains in the shots leads people to jump to silly conclusions. Excellent blog! Ok.. duh.. I get the reference for THIS episode.. but I’m watchin the re-edit where they remove most of the original music..and I commented before the scene. My bad. They put in a schlocky ‘twin peaks esque’ tune at the waterfall scene. Ok.. so is this repeated in other dream sequences? Please don’t post my premature comments. I get it now.